That was the one word email I received from Nutanix’s Sr. VP of Sales (and my boss), Sudheesh Nair, in response to the Q4 2013 Piper Jaffray Storage VAR Survey. The surveyed partners ranked Nutanix second to last in terms of sales performance relevant to plan. Needless to say, I was frustrated. The channel perception of Nutanix was out of synch with Nutanix’s record-setting sales in 2013 as the fastest-growing infrastructure company of at least the past ten years. But understanding and successfully positioning Nutanix has been a learning process for the channel. When Nutanix CEO, Dheeraj Pandey, first approached Lightspeed Venture Partners almost five years ago, he made it clear that his new company would disrupt the storage industry – including the venture capitalists’ existing investments. Unlike most entrants into the suddenly popular hyper-converged space, this revolutionary vision is integral to everything we do at Nutanix. Partners can’t simply pitch a “faster, cheaper, better” storage array as they can with the other early stage companies in the survey. Partners need to be able to articulate and evangelize to their clients how Web-scale is a sea change that is fundamentally altering the infrastructure of the modern, virtualized datacenter. 2014 continued the trajectory of rocketing sales and, gratifyingly, a much broader spectrum of channel partners caught the Web-scale fever as well. From small partners building their businesses around Nutanix to multi-billion dollar channel organizations moving Fortune 500 clients over to Web-scale, Nutanix is changing the channel landscape. According to the latest Piper Jaffray report, channel partners now rank Nutanix sales performance in the #1 position – ahead of CommVault, Dell Storage, EMC, HP Storage, NetApp, Nimble, Pure Storage, Veeam and VMware. The Stern Agee Channel Survey similarly shows a huge improvement in channel recognition of Nutanix. 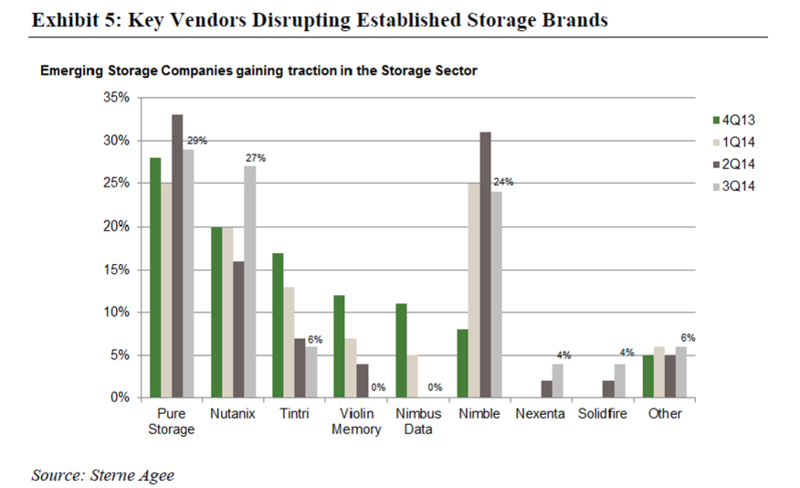 Channel partners listed Nutanix as the second leading key company disrupting the established storage sector – right behind Pure Storage (but quickly catching up). Nutanix is ranked ahead of Nimble (and rapidly increasing the spread), and is ranked far ahead of Tintri, Violin Memory, Nimbus Data, Nexenta, Solidfire and everyone else. It’s exciting to see Nutanix partners across the world enthusiastically embrace the Web-scale opportunity. They’re leveraging Nutanix to differentiate their companies, gain new customers, increase sales and shorten sales cycles. I want to thank all of our partners for your continued faith and trust. The good news is that Nutanix is really just getting started. New capabilities such as one-click hypervisor upgrades, metro availability, connectivity to AWS and Microsoft Azure, among many others, mean extraordinary continued opportunity in the year ahead. Nutanix partners will benefit from the rising tide of web-scale mindshare as Dell launches its XC Series: Web-scale Converged Appliances across the world. But solutions providers currently selling Nutanix-branded appliances through Dell are already discovering other advantages. Choice Solutions, for example, beat out an entrenched Vblock incumbent with the assistance of Dell’s existing server business and its financing capabilities. Nutanix’s Sr. VP of Sales, Sudheesh Nair, likes to talk about the compressing disruption cycle in our industry. Disruption used to take place over a roughly ten year period, but now it occurs on a to a two to four year cycle. Large companies tend to be very, very good at running marathons. They spot emerging patterns and then maintain their leadership through acquisition or internal development. Only rarely have exceptional companies such as NetApp and VMware been able to emerge through the disruptive cycles as large leaders themselves. The datacenter infrastructure landscape is long overdue for disruption. 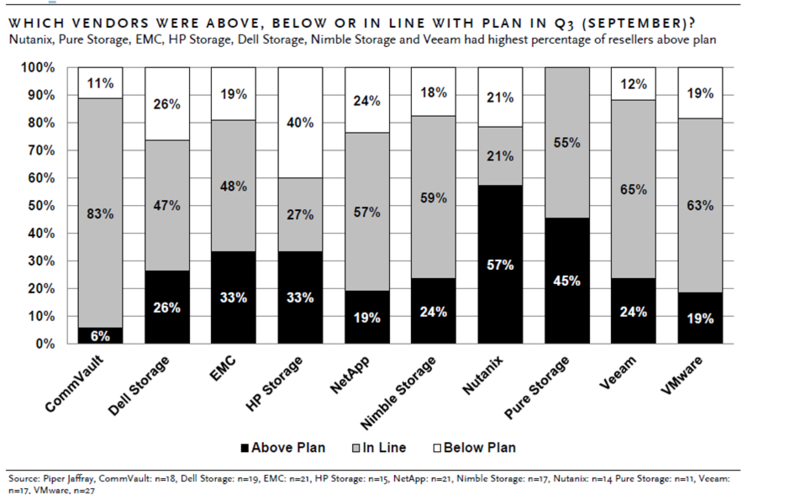 According to IDC, just four manufacturers – EMC, NetApp, IBM and HP, command a 65% market share of storage today. EMC, with a 30% share alone, has been particularly adept at acquiring innovative companies such as Data Domain* and Isilon. IBM and HP acquired XIV and 3Par respectively. Dell’s acquisitions of Compellent and EqualLogic have enabled it to attain a 7% share of the storage market. In contrast, Dell has a 17% share of the server business which is also dominated by a handful of manufacturers: HP, IBM, Dell, Oracle and Cisco own a 77% market share between them. This discrepancy between server and storage market share creates a huge incentive for Dell to leverage its server base to more deeply penetrate the enterprise storage market. While Dell knew that EVO:Rail was coming, it also recognized that EVO would be a 1.0 product lacking the necessary enterprise attributes for wide scale adoption. Enter Nutanix. Nutanix pioneered the hyper-converged infrastructure era just three years ago, but legacy datacenter players have already been scrambling to claim a stake. After EMC’s mid-2013 acquisition of ScaleIO went nowhere, the company now is counting on subsidiary VMware’s EVO:Rail. HP has resurrected its Left Hand Networks product as StoreVirtual with EVO:Rail positioned as a back-up in situations where it can’t sell its own product. Even the leading all-flash array start-up, Pure Storage, has announced it will be coming out with a hyper-converged offering. Dell, however, took a different tact. 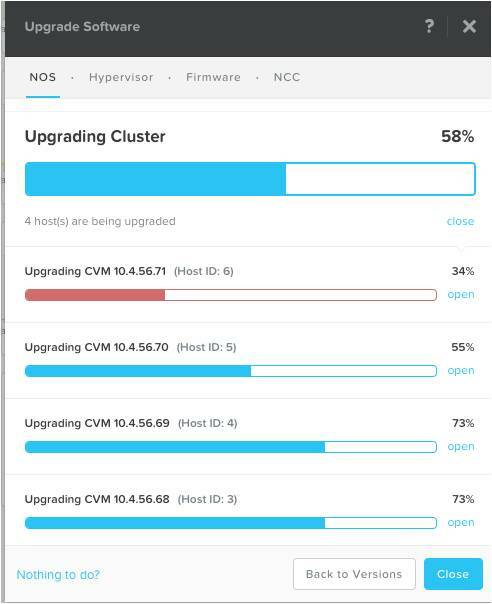 It took a look at all the potential hyper-converged products, including one that already utilized its hardware, and quickly realized that Nutanix’s innovative vision, enterprise capabilities and exceptional support could enable it to make the same type of inroads into enterprise storage that it already holds with servers. Dell’s recognition of the huge opportunity Nutanix presented led to an OEM agreement signing that is reportedly the fastest that the company has ever done. The OEM agreement includes unique terms that ensure Dell will not have a price advantage over other partners selling Nutanix-branded appliances. And Dell is subject to the same stringent rules as all of Nutanix partners in terms of forecasting and registering opportunities. Dell partners cannot sell Nutanix without first meeting the requirements of, and enrolling in, the Nutanix Partner Network. And Nutanix-only partners cannot sell the Dell XC Series. But partners of both companies can sell either product depending upon customer technical, environmental and purchasing requirements. Dell brings a great deal to the table. Customers have a lot of trust in the Dell brand, and Dell already has a pervasive footprint in datacenters across the globe. Its extensive purchasing agreements and contracts with both governmental and commercial entities make procurement much easier. And Dell Financial Services can significantly shorten sales cycles. It’s already been established that once Nutanix gets a foot in the door for a particular use case, customers quickly come to love the simplicity and elegance of the solution. As a result, Nutanix becomes an almost annuity-like business for partners as customers, now unencumbered by the cost and difficulty of scaling arrays, expand their environments. But beyond increased revenues and shortened sales cycles, partners of both Nutanix and Dell also benefit from the tendency of web-scale to expand to more specialized use cases such as VDI, private and hybrid cloud, big data, disaster recovery and remote branch infrastructure. Partners consequently have an opportunity to increase their services business, and to provide more specialized services at higher rates. Between web-scale and public cloud, the $73 billion annual server and storage business is under siege for the first time. As Choice Solutions and other Nutanix partners are already learning, working together with Dell enables them to grow their businesses by grabbing a piece of the massive low-hanging status quo fruit. *The Data Domain acquisition did not go uncontested. NetApp still has a press release on its Web site proclaiming its acquisition of the same company. I’ve headed up channel sales for the Americas at Nutanix for 19 months now, but previously worked on the partner side of the IT infrastructure channel for 25 years. During that time, I saw a lot of disruptive technologies such as Ethernet, VoIP, the Internet, etc. But from a datacenter standpoint, nothing came close to the impact of virtualization. VMware’s introduction of vMotion 11 years ago turned out to be an incredible boon to the IT channel. Solutions providers grew in both number and size as they helped organizations across the globe to virtualize their data centers through the acquisition of high-end hosting servers, SANs and switch fabrics. Many VARs, especially the larger ones, were reluctant to fully embrace VMware’s revolutionary technology. But they were fortunate in that virtualization spread surprisingly slowly; they generally had time to adapt. The VMware consultancy I ran, for example, was purchased after only three years in business by a much larger publicly-traded Cisco partner desperate to quickly acquire virtualization expertise. Today’s disruptive climate is dramatically different. Rather than enjoying an exploding increase in purchases of traditional datacenter hardware, solutions providers are going to see the opposite take place. And the timeframe is going to be very fast. Web-scale technology, as introduced to the enterprise by Nutanix three years ago, has gained exceptionally fast mind share across the globe including an OEM offering by Dell. VMware has introduced its own hyper-scale technology, EVO:Rail, that competes with both its long-term storage partners and with parent company, EMC. HP is jumping on the hyper-converged bandwagon both with EVO:Rail and with an updated version of its Left-Hand Networks. And it’s splitting off half of its business in order to focus on the enterprise space. EMC, the leading storage manufacturer, has been seeking to be acquired. VCE, the leading player in the so-called “converged infrastructure” space has increasing animosity among two of its primary partners, and Cisco is rumored to have turned off the financial spigot. AWS is making big strides as they work to take away everyone’s hardware business. According to IDC, the total server and storage market is now over $70B annually. An incredible $56B of this business is done by only seven vendors (eight once Lenovo’s purchase of IBM’s server business is reflected): EMC, HP, IBM, Dell, NetApp, Oracle and Cisco. Most of this revenue flows through channel partners. As the status quo business decreases, resellers are going to have to react very quickly to compensate. All solutions providers say that they have their customers’ best interests at heart. But infrastructure VARs are typically dependent upon a few, or less, of the handful of leading datacenter manufacturers for most of their business. The VARs make significant investments in trainings for both salespeople and technical folks. They work to obtain both individual and organizational certifications. They attend manufacturer conferences, engage in manufacturer led demand-generation events, and develop close relationships with their manufacturer partners. In return, the resellers receive Marketing Development Funds, access to sales and engineering resources and, most importantly, opportunities. This channel structure has worked quite well since the early days of IBM-initiated solutions integrators, and many reseller organizations are now doing hundreds of millions or even billions of dollars in annual revenues. But the channel structure can often make it challenging to put customer advocacy ahead of manufacturer loyalty. When a manufacturer, for example, introduces a partner into a new account, that partner has to push the manufacturer’s products regardless of whether or not the technology is the best fit. Introducing a competitive product would spell the death knell for receiving future opportunities. Partners of the leading datacenter incumbents need to be careful even in their existing accounts of mentioning one of the newer disruptive technologies as an option. The partner will typically position it, if at all, only in situations where the incumbent either lacks a competitive product or is not likely to notice. The alternative is to risk the potential wrath of the datacenter giant. So while a channel partner will privately often concede that, say, web-scale infrastructure makes a lot more sense for a virtualized datacenter than a Vblock, it can’t even bring up this option to the customer for fear of jeopardizing its large Cisco and EMC revenue streams. The manufacturer relationships supersede the customer’s best interest. Ray Noorda of Novell used to tell his partners, “In mystery, there’s margin”. Today’s corollary might be, “In boldness, there’s opportunity”. The handful of infrastructure giants are selling virtualized organizations tens of billions of dollars worth of equipment that was designed and optimized for a physical datacenter. Enterprising channel partners have an extraordinary opportunity to educate clients and prospects about the advantages of web-scale converged infrastructure. Not only is the revenue and profit potential vast, but they can also differentiate themselves from the pack as innovative, forward-thinking, and as leaders in integrating cloud technologies. Weak Demand for Storage Systems…as Worldwide External Disk Storage Systems Revenue Falls for Second Consecutive Quarter. 09/05/2014. IDC Press Release. Server Refresh Cycle Propels Industry Forward in Q2. 08/27/2014. Charlie Osborne. ZDNET.